An herb garden is not complete without great smelling plants like Aloysia triphylla. The leaves of lemon verbena are a common ingredient in herbal tea at my house. I pick and then nibble on the leaves as I walk through the garden for the lemony taste. Aloysia triphylla is often deciduous or nearly so in the winter unless you are very close to the coast. I cut my Lemon Verbena back to about 2 feet tall each winter. Each summer it grows back to 6-8' or more. 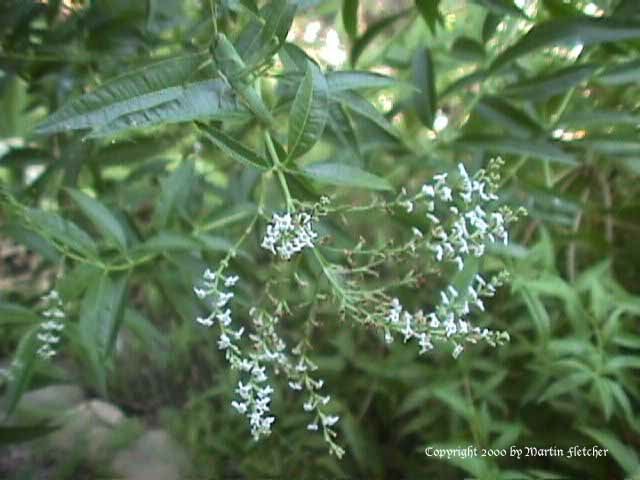 The fragrant foliage livens the nostrils when brushed up against while walking by, so I often locate the Lemon Verbena near a pathway to wake up all of the senses. As evidenced by the grasshopper in the upper left corner, we are not the only ones that find Aloysia triphylla attractive. This Lemon Verbena still has leaves, I think he was doing his eating elsewhere. Flowers and foliage of loysia triphylla the Lemon Verbena.